It's not often that I get to eat with Big Mac. We are usually not in the same city, so we only get to see each other when I visit Taipei. I was therefore very excited about him moving here, because that meant (hopefully) we would get to eat out together more often. Tonight's organizer suggested that we meet at Chiu Tang (潮廳), which is an exclusive restaurant/lounge whose cuisine I have enjoyed a few times. They also know how to handle wines, which is definitely a plus. He then asked if we wanted some soup, and suggested that we have the whelk head soup (螺頭湯). I said OK to this, and he left our private room after noting down other items. A mere two minutes later, a light bulb went on in my head and I came to my senses. I grabbed a menu, rushed out to him, and asked him to confirm the soup that he suggested and that I had just agreed to. It was the double-boiled fresh sea whelk head soup with black chicken and fish maw (花膠鮮螺頭燉竹絲雞), and at HKD 398 per bowl, the total cost for the 7 of us would have come to more than HKD 3,000 after service charge. I quickly nixed this, and picked a more traditional (and budget-friendly) alternative at a mere HKD 98 per bowl. Chilled giant flower crab Chiuchow-style (潮式大紅蟹) - first to arrive at the table, which was just as well. Seven of us split this one crab, which meant that I got to have one piece of the body with two small hind legs attached. The crab was very good, as I had expected it to be. Soy-marinated platter (鹵水拼盤) - this came with pig-trotters, pig intestines, sliced goose, goose intestines and tofu. Very yum. Deep-fried grey mullet with salt and pepper (椒鹽九肚魚) - the Bombay duck was very tender, not bad at all. Deep-fried home made mashed shrimp ball and crab meat ball (自家製蝦蟹棗) - the elongated shrimp balls had a softer texture and had diced water chestnuts inside. The round crab meat balls had a firmer, chewier texture. Marinated goose liver (鹵水鵝肝) - for some reason our platter didn't include goose liver, and I had to specifically add it as an additional order. I think the waiter probably thought we were complete cheapskates and would never order it, so he didn't plan on sending us any... Of course this was pretty yummy... It's a signature dish, after all! Stir-fried leafy amaranth (清炒莧菜) - this was very young and tender. Top quality ingredient. Pan-fried noodle with Chinese chive accompany sugar and vinegar (黃金伊麵) - another signature dish in Chiuchow cuisine, and they do it very well here. The noodles are pan-fried until they're golden on one side. The other side is sprinkled with a layer of finely diced yellowed chives (韮黃), and then the whole thing is flipped upside down onto the plate, so that the chives are now underneath the noodles while the crispy layer is on top. Black vinegar and sugar is then added to taste. Soooooo yummy. Steamed dark sugar care honey sponge cake (蜂蜜黑糖糕) - umm... I think they meant "sugar cane". Anyway, this wasn't nearly as good as the last time I had it. While there was some fragrance, it was a lot more muted and bland tonight. 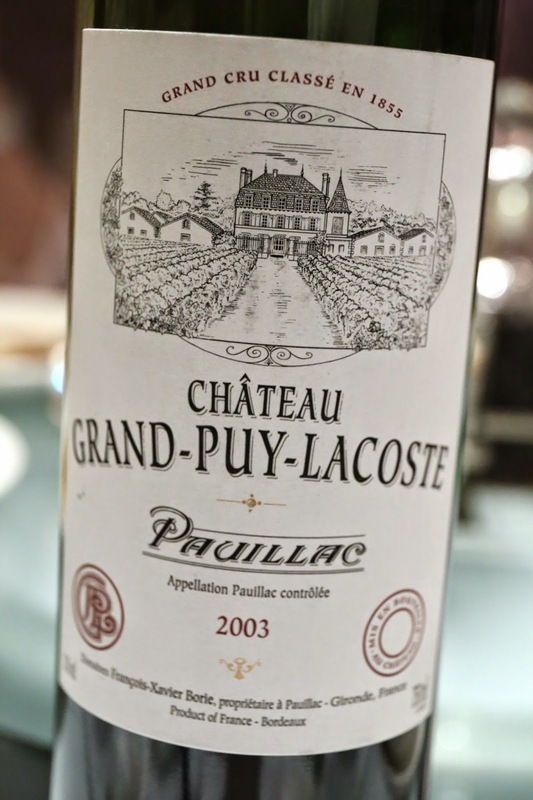 2003 Grand-Puy-Lacoste - minty, a bit smoky. Classic Left Bank that never goes out of style. 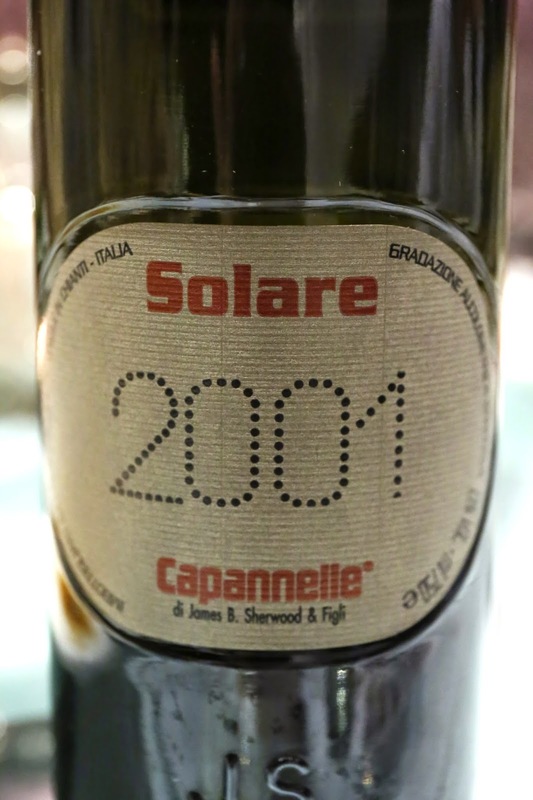 2001 Capanelle Solare - a little smoky, some tannins here, and I could smell the acidity. 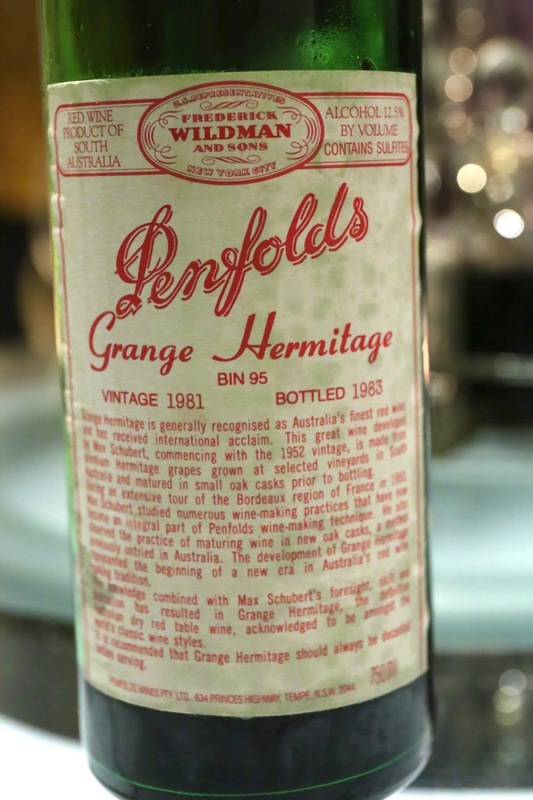 1981 Penfolds Grange - very obvious coconut butter, sweet, vanilla, a little leather, and minty. Smooth on the palate now but still full-bodied. And just imagine if I had said "yes" to the other suggestions from our waiter. Our bill would have come out to be HKD 2,500 a head instead of HKD 1,000... Could we "afford" it? Yes, we all could. Would we be happy campers after that meal? Most certainly not. I, for one, would have felt that I did not get my money's worth. At HKD 1,000 a head, it wasn't "cheap" by any means, but the quality of the food was such that we could justify paying that price for the level of happiness delivered in return. I guess that's similar to my experience with another meal last much, where less was actually more! No, I'm not worthy enough to dine in this restaurant... is the inevitable conclusion after tonight's dinner.